A 30-year-old carpenter presented with a history of generalised swelling of his body, particularly noticeable around the ankles. He had a 10-year history of pulmonary tuberculosis, which had been treated with antitubercular treatment for 6 months. He had developed cough with fever 1 year previously, and was given antitubercular treatment with a local practitioner after a sputum examination that was found to be positive for acid-fast bacilli (AFB). He had to stop his treatment after a month so that the money required to buy the medicines could be utilised for his sister, who was also ill. After 2 months of stopping his own antitubercular treatment, due to financial reasons, he decided to try the free supply provided by the directly observed therapy (DOT) programme run by the government and after 2 weeks stopped again due to severe anxiety symptoms. On evaluation in our hospital his sputum AFB was 2+ and after sending another sample of sputum for AFB culture sensitivity, he was given five drugs that included injections of streptomycin, isoniazid, rifampicin, pyrazinamide and ethambutol. All this was again made available to him free of charge through the DOT programme. 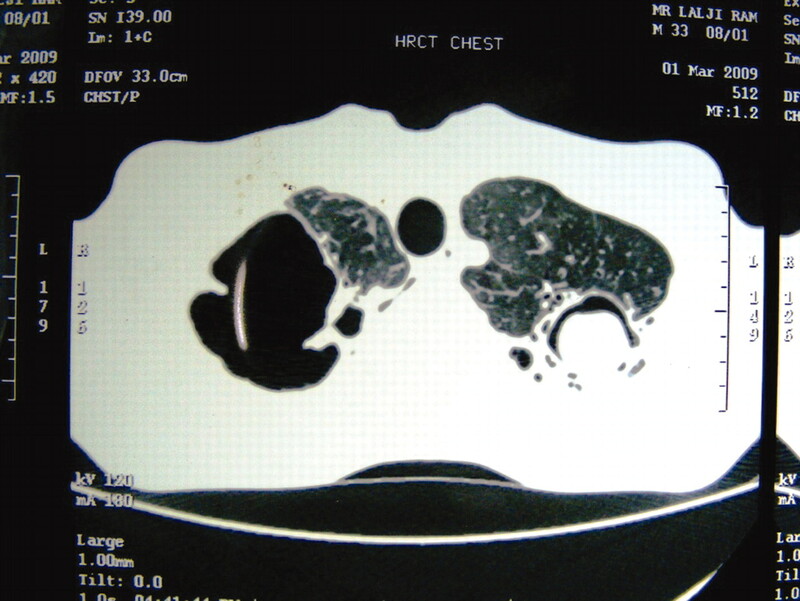 His chest x ray (posterior–anterior) view and a CT scan of the thorax revealed significant findings (figs 1 and 2). 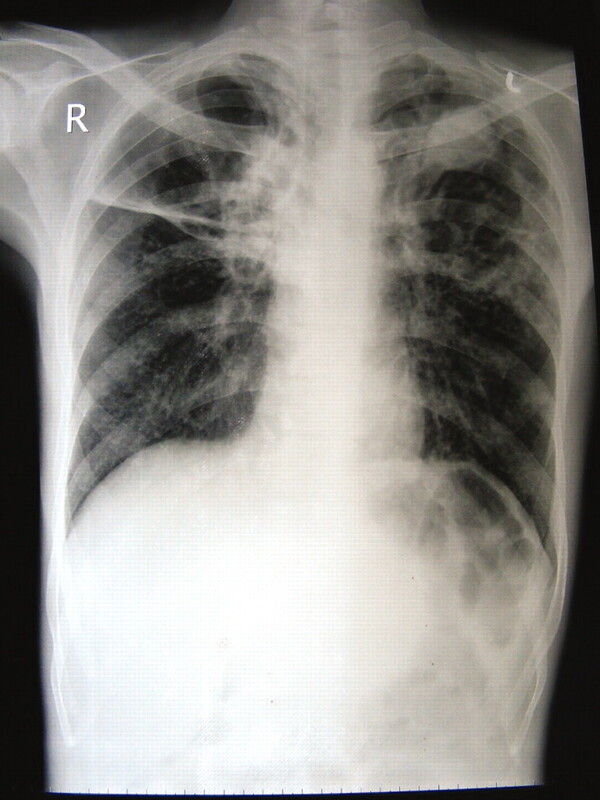 Chest x ray (posterior–anterior) view showing significant findings. CT scan of the thorax showing significant findings. He was evaluated for his anasarca and found to have a 24-h protein excretion of 9 g/day for which he was further evaluated with a renal biopsy (figs 3 and 4). Renal biopsy microphotograph staining positive with Congo red. The chest x ray revealed a large lucent destructive parenchymal lesion in the right upper zone, which was almost completely devoid of any lung markings. The left upper zone shows the presence of a well defined, rounded radio-dense shadow with a crescent lucent surrounding the rounded shadow. The findings on CT confirmed that of the chest x ray. It showed a large hypodense, destructive, parenchymal lesion in the right upper lobe and a large, nodular lesion in the left upper lobe with a crescentic halo suggestive of a fungus ball formation in a cavitating lesion. The renal biopsy microphotograph in fig 3 shows patchy mild to moderate mesangial expansion by eosinophilic hyaline material, along with mild chronic interstitial inflammation with interstitial oedema admixed with polymorphs. Few hyaline casts are seen. 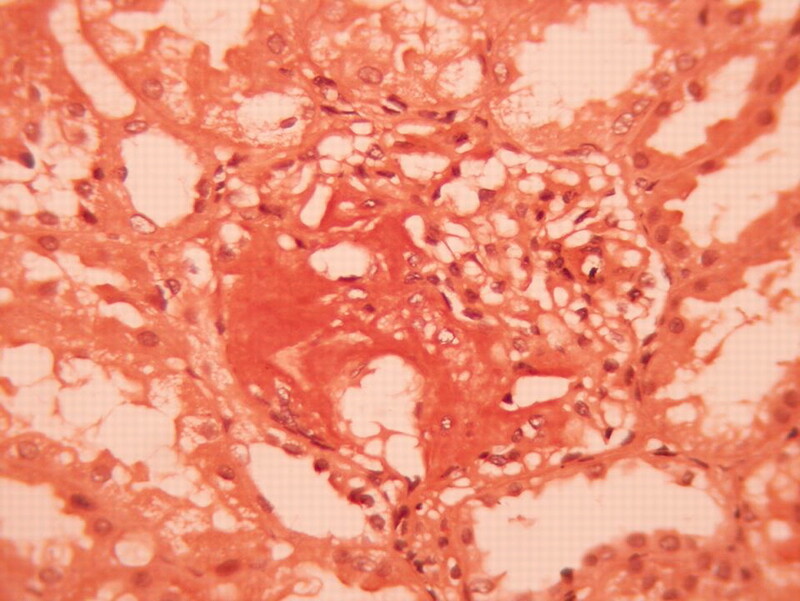 Figure 4 shows the renal microphotograph staining positive with Congo red for amyloid. This patient experienced chronic pulmonary tuberculosis and its known sequelae, which ranged from a localised asymptomatic pulmonary aspergilloma detected on radiology to that of florid nephrotic syndrome due to renal amyloidosis as proven on biopsy. The authors acknowledge all care givers of this patient, including his relatives.
. A study of amyloidosis in pulmonary tuberculosis. Indian J Tuberc 1970; 17: 70–1.
. Serum amyloid A protein and C-reactive protein levels in pulmonary amyloidosis: relationship to amyloidosis. Thorax 1984; 39: 196–200.
. Recovery from generalized amyloidosis secondary to pulmonary tuberculosis: report of a case. Arch Intern Med 1936; 57: 562–5. Patient consent: Patient/guardian consent was obtained for publication.